At long last, the survivors of Robert Kirkman and Charlie Adlard's acclaimed post-apocalyptic survival adventure find the hope they've longed look for. Can a town not yet ravaged by the horrors unleashed on Earth possibly be all it's hoped for? Is there a far more sinister secret behind their newfound safe haven? Even worse, can people forever changed by the worst in humanity ever hope to get back to their old selves? The next chapter of The Walking Dead is primed to change everything. 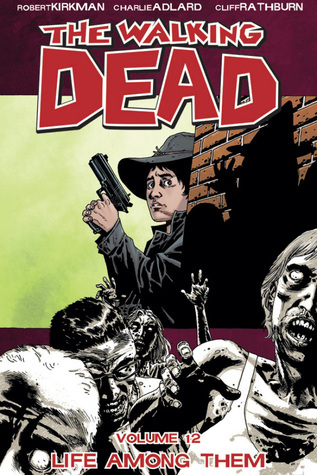 The twelfth volume of The Walking Dead includes issues 67-72. When the group find out that their trek to DC might be a waste of time, a man pops out of nowhere. He introduces himself as Aaron and claims to have been watching them interact for days. He's part of a peaceful community that's barricaded against the zombies. People there are apparently leading normal lives while the rest of the world falls apart. So the group decides to go with him, but are pretty skeptical. After everythi...moreThe twelfth volume of The Walking Dead includes issues 67-72. When the group find out that their trek to DC might be a waste of time, a man pops out of nowhere. He introduces himself as Aaron and claims to have been watching them interact for days. He's part of a peaceful community that's barricaded against the zombies. People there are apparently leading normal lives while the rest of the world falls apart. So the group decides to go with him, but are pretty skeptical. After everything they've been through and all the crazy bastards they've crossed paths with, who can blame them. I can't say I blamed them. As I was reading this volume, I couldn't help but hold my breath. I kept waiting for some big, dark secret to come out of this. There's no way these people can live in peace and harmony behind these concrete walls with so many undead outside. There's got to be something Douglas is hiding. Maybe I'm as jaded as the rest of them, but I don't trust the leader of this seemingly 'normal' place. :/ Besides, he's a politician!